A chief reporter who edited a weekly newspaper prior to its closure in October is set to leave the industry for a new role in public relations. Ben Falconer, left, edited Stroud Life for more than three years until the title was shut by Trinity Mirror last year, and has worked as chief reporter on the company’s Gloucestershire Live website since then. However, he will leave his current role at the end of next week, after almost 20 years in the industry, to become corporate communications manager at Stroud District Council. HTFP reported yesterday how Gloucestershire Live editor Jenny Eastwood’s job is understood to have been put at risk as a result of wider cutbacks at Trinity Mirror newsrooms in South-West England, the Midlands and Liverpool, but Ben’s departure is unrelated to this restructure and he is leaving of his own accord. 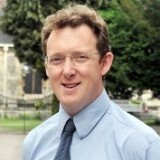 Ben started his career on the Gloucestershire Gazette in 1998, moving to the Stroud News & Journal the following year. He later worked for Gloucester daily The Citizen, serving as health reporter from 2004 to 2007 and chief reporter from 2007 to 2013. In 2006 he was made an honorary midwife by the people of Stroud for campaigning journalism in helping to save the town’s maternity unit. He took on the editorship of Stroud Life in June 2014. Good luck in your new career, Ben. One of the good guys is Ben. Great reporter too.